Ivan, a western lowland gorilla and the star of Katherine Applegate's The One and Only Ivan, passed away yesterday at the age of 50. Late last month, Donna Kouri, Laurel Snyder, and I spent an hour with Ivan's caretakers and met Ivan. I still don't think it has fully sunk in that I met him, observed him carefully peel an orange, and learned about his daily life. It was a deeply moving experience that had a profound impact on each of us. Laurel Snyder says it best: "I met Ivan just a few weeks ago. It was a magical experience. Awful he's gone, but so nice to know personally that he was munching fruit and painting pictures up until his final days." "At least on the page, where anything is possible, I wanted to give Ivan (even while captive behind the walls of his tiny cage) a voice of his own and a story to tell. I wanted to give him someone to protect, and the chance to be the mighty silverback he was always meant to be." Katherine, you succeeded and have inspired countless people to put your captivating and beautiful novel in the hands of as many readers as possible. Ivan will live on because of you. 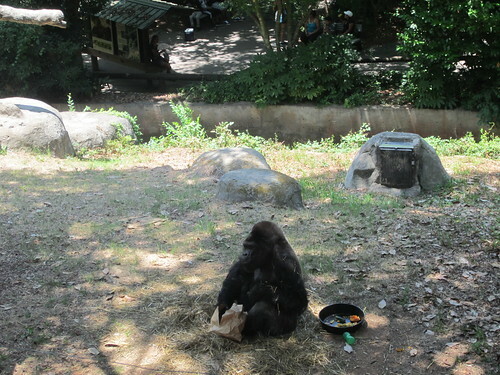 I bet he is surrounded by buckets of bananas, oranges, and yogurt raisins. Thank you! Thank you! Thank you! When I learned about this earlier, my first thought was of you and that green thumbprint. So lovely that you did this this summer! Me too... I thought "Oh, Mr. Schu". Thank goodness for your summer trip. I feel so blessed that Katherine Applegate blessed me with Ivan's story. I cannot imagine a world where I wasn't able to share the story of this mighty silverback. Mr. Schu, thank you for bringing Ivan to life for me. Following your visit with Ivan through email, blog, text messages, tweets, direct messages, and Google docs I felt like a little piece of me met Ivan with you, Donna, and Laurel. A day doesn't go by when I don't feel lucky to be your friend. Today, however, I feel extra lucky. This was a beautiful post; thank you for sharing it (even if it made me cry)! I'm sitting here in my school library and the kids want to know why I am crying. The book and Ivan himself moved me so much. Very sad. In Christchurch New Zealand we send our condolences. My son is sitting behind me, trying to go to sleep, and asking about Ivan. Thanks to Katherine for the gift of introducing all of us to Ivan. Thanks to you for making it even more real. I am sorry to read this, but even happier that Katherine Applegate decided to write Ivan's story. I have always loved gorillas, and I love THE ONE AND ONLY IVAN. An amazing book. And thank you, Mr. Schu, for posting the video of Ivan. Aww, I'm sorry to read this. 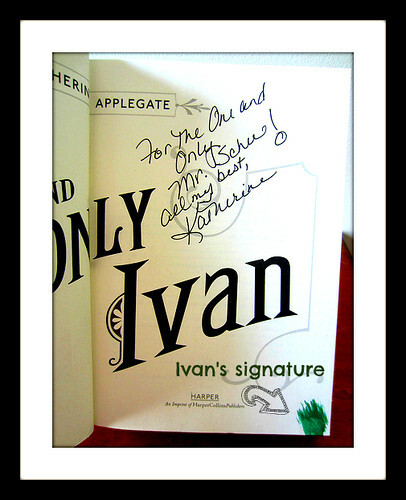 But, I'm happy that Katherine Applegate chose to write Ivan's story. It's an amazing book! And thank you, Mr. Schu, for posting a heartfelt tribute to Ivan and the video. What a breath-taking creature, Ivan was. I'm so sad to hear about Ivan. Thank you for loving this book. Because of you, I plucked it off the shelf of my library and loved it, too. "Right now I would give all the yogurt raisins in the world for a heart made of ice." Thank you Ivan, Katherine, and John. What a beautiful post. I am about to go tell my 8th grade sister (who read Katherine Applegate's book this summer) about Ivan's death. I know she will be as upset as I am. This is heartbreaking! So glad Ivan will live on in the hearts and minds of children each time they read Katherine's book. This is heartbreaking! So glad Ivan will live on in the hearts and minds of every child who reads Katherine's book. So sad to hear about Ivan! Thankfully everyone will get to read about him in Katherine Applegate's lovely novel. I know you'll always treasure your visit with him. I just shared your post with the teachers' whose classes I read Ivan to last year. This is so sad but thank you Katherine Applegate for sharing his story. Thank goodness for the power of story. I never would have heard about this book had it not been for you and Colby Sharp. I picked the book up awhile go, but when you were tweeting about your visit with Ivan I decided I had better read that book! I of course had tears in my eyes the whole way through the end of the book. You were like Julia, the artist who saw what Ivan imagined when you spread the word of Katherine's beautifully written novel. Just think Mr. Schu- your love for Ivan and his story inspired how many others to pick up that book. And it is only fitting that someone as awesome as you got to meet him! I follow you on twitter and just wanted to say that I never would have read this book on my own if it had not been for you and Colby Sharp. I picked up the book awhile ago, but it wasn't until you were tweeting about meeting Ivan did I decide it was time to read it. I of course found myself crying from the moment the second box arrived until the end. I see YOU as Julia the artist who saw what Ivan imagined when you shared with us your love for Katherine's beautifully written novel. Just think Mr. Schu- how many people read the story of Ivan because of you! It is only fitting that someone as awesome as you had the honor of meeting Ivan! Thank you for introducing me to this book, Mr. Schu. I am saddened by Ivan's loss. I look forward to sharing Katherine Applegate's beautiful story with my students. We're so saddened to hear of Ivan's passing, but glad his memory will live on in Katherine Applegate's beautiful story. How wonderful that you, Laurel, and Donna had the chance to meet him. Rest in peace, Ivan. The power of that book is truly amazing. I didn't know about this until reading your earlier post, Mr. Schu. We are all fortunate to have met Ivan through Katherine's wonderful book. I bought another copy of Ivan and we got it at the end of the day. The kids were arguing over who was going to get to read it first. Thank you, Mr. Schu, for introducing me to Katherine's wonderful story of Ivan! We just got another copy of Ivan today for our classroom library. The kids always INSIST on watching me open packages of new books. When I opened this one, the kids immediately began arguing/asking who would be able to read it first. I think I need twenty-something more copies... Thank you, Mr. Sharp and Mr. Schu, for introducing this to me so I could introduce it to my kids, and to Katherine for sharing this amazing story so wonderfully.